June 12, 2011 Dan O. Makes me wanna hang-out with my childhood friends again, or what’s left of them anyway. Living in a small town in the summer of 1979, Joe Lamb (Joel Courtney) helps out his friends film their monster movie while trying to move on from the death of his mother. While filming a scene at a station, a truck smashes into an oncoming train forcing it to derail. After the immense explosion, something escapes from the wreckage. Joe and his friends then witness several strange events around town while Joe’s father (Kyle Chandler) tries to keep the peace and the shady military begins to occupy the once sleepy town. From the beginning nobody had any idea just what this film was about and then everybody started to notice it was like an old Spielberg film. Now of course, this is a big homage to such sci-fi classics as “The Goonies”, “Close Encounters of the Third Kind”, and “E.T”. During this whole film, you’ll definitely be reminded of those films but I can promise you this isn’t a parody, this isn’t a rip-off, it’s just an homage to those old films and with Steven Spielberg as producer, its a great homage. Writer and director J.J. Abrams obviously grew up loving these films and I could feel it watching this because with every little element to this film, he does it all right. Abrams keeps this story moving at a nice pace and doesn’t try to do anything that would seem phony or cheesy in any way, he tells the story like it is. Abrams also does a great job at not actually showing us “the monster” and when we actually do its great because the whole time during the film we are just left in total mystery of what this thing is, and what is behind all these strange happenings. The explanations Abrams give us are reasonable, but the mystery of the plot is what really sold me here because I really wanted to see what this damn thing was. My only problem with this film was the fact they did a bad job of making the Army seem like the bad guys, which isn’t really a problem considering so many films do that nowadays. I just felt like this film was so much smarter than all those others, but made these Army officials look like complete dicks, but then again, this film did need some conflict in between everything else so I understand. The cast here is full of a bunch of random people but their all good. Joel Courtney is great in his big-screen debut as Joe, who carries that emotional weight of the story on his shoulders and doesn’t let up once. Great performance, and I can tell that this kid has got himself a good career ahead of him. Elle Fanning is growing up pretty quickly and is actually my favorite from the cast as the sort of bad girl, Alice. The rest of the kids are pretty good too, but my main favorite was Riley Griffiths as Charles, and is just hilarious the whole time through and kind of reminded me of a younger Dan the Man I must say. 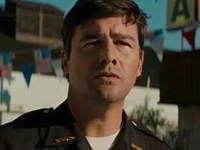 Let’s not also forget the always reliable Kyle Chandler as Joe’s Dad, Jackson, who finally gets some big-screen time here as well. What really had me here was that this is just a whole lot of fun, but still with something to show for it. The visuals, especially the train crash, are absolutely amazing and just look so realistic. The screenplay here is also near-perfect because even though all these crazy explosions, invasions, kidnappings, and strange happenings are occurring, this is still all about the kids and with good reason because their just so fun to be around. The film reminded me of “Stand By Me” because this actually showed kids talking like kids again. They aren’t all squeaky clean and know-it-alls, these ones insecure, curse like it’s nobody’s business, and altogether, innocent. This film is all about the kids and how they relate to each other and not once does it hit a false-note at how the kids and their parents unify, or don’t unify during these strange events. I was totally surprised by how much of an emotional weight impact this had on me and when I left the theater, I just felt happy. Consensus: Some may be annoyed from the constant nostalgia feel of this film, but Super 8 is a J.J. Abrams’ beautiful homage to all of the old Spielberg films of the 80’s with a great screenplay that is funny and emotional, fun action, and just reminds us what Summer blockbusters should always be like. Thanks! I liked it so much James! 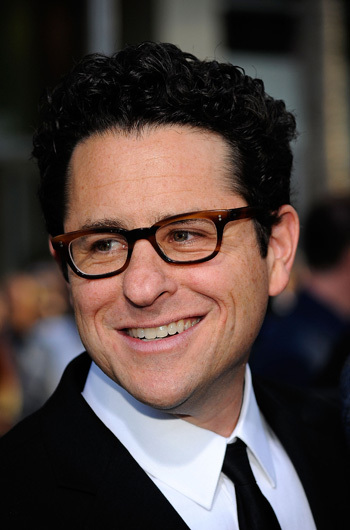 I agree with your point: J.J.Abrams must have loved all those movies back then. He gave us an adventure and it was a true adventure that had the power to turn us into kids for a short time. Being the movie so crammed with events and characters, I guess there wasn’t enough time to develop the film any further and make, let’s say, the military personnel less static and stereotyped. Besides, keeping the movie below the two hours was a wise decision. The time was good and it didn’t feel long one bit. The only problem was just that I felt like they could have done a better job with the military angle. Nice review! I loved this movie. It really is a wonderful homage to my favorite director, Stephen Spielberg. That Spielberg movie feel was the first thing I picked up on when the first full trailer was released and I knew I just had to see it. It’s a great homage to a true legend, and I was so glad that everything worked out just the way it should. Great review. Super 8 also reminded me of the old Attack of the 50 Foot Woman styled movies…a small town devastated by a unknown force, or entity, and one pulls for them to rally and defend themselves. I was conscious of Abrams preventing us from seeing the monster (waiting for Jaws, in other words). Taken all together, a nice afternoon in a movie theater. It was a good afternoon at the movies, and the way Abrams does everything works because I just was so into it the whole time. Thanks man! Definitely check it out, you won’t be let down! I agree completely and as a movie lover I have no problem with nostalgia when it is so beautifully orchestrated within the context of the story. You walk out of the theatre wanting to share the good vibes with all your friends and family. This is one film you want to relive. Great review! I had such a big smile on my face when I left, and it just made me happy that I spent a Saturday night at the movies. Thanks Snake! High praise here … I dug the nostalgia here … good review Dan! High praise here … I dug the nostalgia in the film … good review Dan! Thanks Sam! I liked this film a lot mainly because I just felt I was one of those kids and was there with them almost. wow. the trailer does nothing for it. but i think i’l catch this on a rental. Check it out Candice! You won’t be disappointed! I like the review. I do disagree with the job they did with the airforce. I bet with the units that cover up things on a need to know basis that the guys in those units are a bunch of dicks. The more I thought about this movie today the more I think it will be one of those movies that in a couple of decades we look back on as a classic. Only time will tell though. The military thing just kind of bothered me but despite that you’re right about it being classic because anybody can watch it really. Thanks Steve! I like your review. It highlighted all the great successes of this film, and there were many. But believe it or not, I actually thought the visual effects were a bit misused. They didn’t seem to be put in a context where they inspired awe. My idea here is that the train crash is just too jarring of an inciting action. If you watch old Spielberg’s you’ll notice how the special effects are sort of slowly introduced ever so slightly to complement the character’s growing acceptance of the strange events. As for the children, I totally agree (and I’m sure everyone does). They were absolutely perfect in casting and writing. I couldn’t have asked for anything more there. So, yeah. Far from being put off by the nostalgia, I wish they were even more nostalgic and bypassed the need for modern visual effects. I would have liked them to have maintained the subdued 70s-80s atmosphere all the way through. I see what you’re saying but for me, I just getting that feeling an old trip down memory lane once more and this film fully did that for me, but in a more effective way than I actually expected. This ought to be one worth watching in the theatre if I can get a hold of any money. Yeah Steve, I was lucky to actually have some moolah with me in order to see this but check it out as soon as possible man. Thanks! I didn’t care for this movie at all, unfortunately. There were too many plot holes, hackneyed cliches and an overwhelming reliance on nostalgia for me to really enjoy it. I felt like the ending was a bit of a cop out, too. Glad you got more out of it than me, Dan. Good review as always. I guess this movie just isn’t for everyone. Thanks though Eric! This movie was everything I hoped it to be. Abrams and Spielberg are a great duo together. Great review! Good review, sir. I am complete agreement that the kids did a bang-up job and that the train wreck was unbelievable. I’ve heard some gripe that there is little resolution between parents and children at the end of the film. Just a hug and everything is all better. I didn’t notice but I guess they coulda wrapped things up better. I’m glad I read this particular one actually because I watched the trailer and wasnt actually interested in the film in that it didnt really show anything special about it; But actually, now I’ve read this, I’m quite eager to see what it’s actually like! I hope it’s one of those films when the trailer looks crap but the film itself is actually amazing. Will definately try and go to watch this now, thanks!